Laos traces its history to the kingdom of Lan Xang, which existed from the 14th to the 18th century when it split into three separate kingdoms. In 1893 it became a French protectorate with the three kingdoms, Luang Phrabang, Vientiane and Champasak, uniting to form what is now known as Laos. It briefly gained independence in 1945 after Japanese occupation, but returned to French rule until it was granted autonomy in 1949. Laos became independent in 1953, with a constitutional monarchy under Sisavang Vong. Shortly after independence, a long civil war errupted between the Royal Lao Army and the communist Pathet Lao. Laos eventually became involved in the [[Vietnam War (1954-75)|Vietnam War]] when the North Vietnamese began using the country as a supply route for its war against South Vietnam. This led to a massive bombing campaign by the United States between 1964 and 1973, including the use of cluster bombs. In 1975 the Pathet Lao overthrew the monarchy and established a communist govermment. Stauffer, Brenda. "Laos." Global Anabaptist Mennonite Encyclopedia Online. May 2014. Web. 25 Apr 2019. http://gameo.org/index.php?title=Laos&oldid=122095. Stauffer, Brenda. (May 2014). Laos. Global Anabaptist Mennonite Encyclopedia Online. 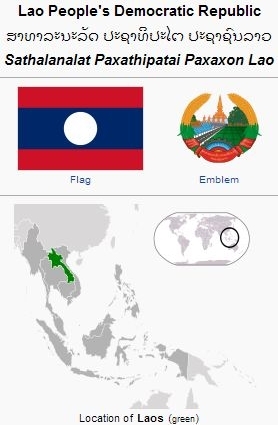 Retrieved 25 April 2019, from http://gameo.org/index.php?title=Laos&oldid=122095.